Judging from the number of my recipes under the 'chicken' category, you can easily tell that my favourite part is the wings. Here's another rendition of the standard barbecue sauce for wings. I liked the little sharp tinge of spiciness from the Tabasco and the paprika although you can entirely omit these two and it can still stand on its own. I adapted this from one of those free recipe leaflet in Morrison's (a local supermarket). Quite tasty and would not go amiss in the barbecue come summer time. Combine together all the ingredients in a bowl (except the chicken and oil). Marinate chicken for at least 2 hours or overnight. 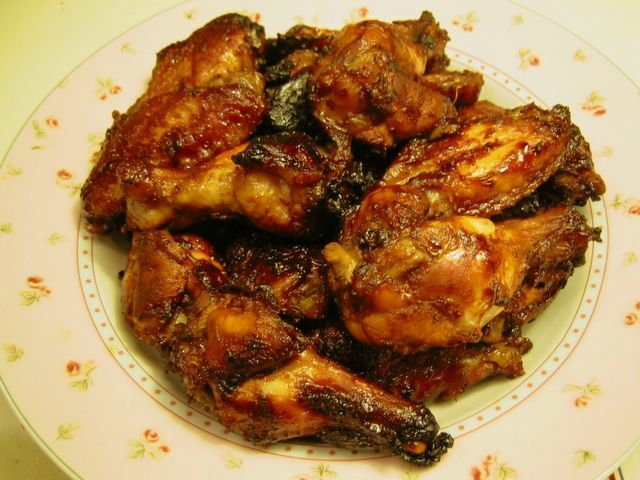 Remove the chicken wings from the marinade. Arrange on a baking tray. Brush lightly with oil. Bake for about 35-40 minutes or until the meat is no longer pink in the bone and turning the wings from time to time. You may also cook this in a barbecue in which case it has to be grilled for 6-8 minutes on one side. Then turn and cook for another 10-12 minutes. Before removing check first if the meat is thoroughly cooked.